I think this says it all Alan. Most theoretical physicists have the humility not to presume that a factor that includes a premise that is not experimentally tested is either right or wrong. I'm certainly not going to waste my time repeating why and where you are making presumtions again and again. If there is more matter outside the observable universe, stuff further away from us will have both a local (clumping) and a general (expanding) motion." Great hypothesis, good luck finding Dark Matter and Dark Energy. Explaining the Big Bang, Inflation, and when we will start seeing the unobservable mass moving towards us. Oh, and please @ me when you can think of an experiment to prove those velocity related redshifts. I think we are done here on this subject Alan. It's clear that a 'contracting' model is not your cup of tea. @Colin2B If you have not been completely put off by Alan's religous beliefs concerning the nature of the redshift observations, I would care to continue with you. If not. then no matter, and thank you very much for the mathematical information that you did impart to me concerning c^2/R. That was useful to me. Unlike you I have not made a single presumption nor stated as fact anything that has not been experimentally proven - in most cases by experiments that you have quoted but clearly not understood. Your insult has not fallen on deaf ears. Goodbye. For the sake of anyone else who is reading, Alan has made a very serious presumption about redshift observations. It is not proven that the cosmolgical redshift observations are velocity related, therefore it is presumptuous to state as fact that grav.source minus grav.receiver is the total sum of gravitational shift. I have this information from the mouths of professional physicists, who write books on the subject. I certainly have not 'meant' to insult Alan, but I will not be told that grav.source minus grav.receiver is the sum total of gravitational shift for cosmological redshift observations, when the velocity related redshift for those observations is not proven. Evidence for this fact can be observed in the article that I previously posted. Clearly no science magazine, or scientific journal would entertain Wetterich's, or any other physicists reinterpretation of redshift observations if the matter had been proven! "Wetterich's paper hasn't been peer reviewed yet, but thus far, comments by others in the field suggest openness to this new line of thinking"
@Colin2B ..... I would care to continue with you. If not. then no matter, and thank you very much for the mathematical information that you did impart to me concerning c^2/R. That was useful to me. I am happy to continue proof reading and pointing out where your text is unclear, but would not comment on whether it would be acceptable to the physics community as correct. Might be some delay in reading and responding over next few weeks as quite busy. I never said they were, though it would be presumptuous to state that there is no velocity component involved, especially when it can be distinguished in nearby objects (from laboratory to galaxy) whose velocities can be measured independently. The only observations I quote are that distant objects generally have larger redshifts than near ones, and the CMB redshift is apparently less than some distant galaxies, which suggests relative motion between them. If this finding can be attributed to Doppler or Hubble effects, I have suggested how it can be consistent with a locally contracting universe. therefore it is presumptuous to state as fact that grav.source minus grav.receiver is the total sum of gravitational shift. It is never presumptuous to state what is either a tautology or an experimental fact. @Colin2B Thanks, couldn't ask for more. I am going to take a break for a bit (couple weeks maybe) and concentrate only on my paper. I have a lot of considering to do as to which aspect to describe first, but your questions have given me clues as to how to proceed. I never said they were, though it would be presumptuous to state that there is no velocity component involved, especially when it can be distinguished in nearby objects (from laboratory to galaxy) whose velocities can be measured independently. ...does rather rely on a velocity related interpretation of redshift observation, and special relativity calculations. And isn't there a discrepancy regarding galaxy rotational velocities? That requires that there be this elusive property called dark matter in order to describe these decepancies of 'extra' velocities? The only observations I quote are that distant objects generally have larger redshifts than near ones, and the CMB redshift is apparently less than some distant galaxies, which suggests relative motion between them. Yes, my model describes that distant objects have larger redshifts than near ones. Yes, my model states that the relative motion between the CMB and galaxy clusters is relevant. If this finding can be attributed to Doppler or Hubble effects, I have suggested how it can be consistent with a locally contracting universe. I do not disagree. But this is not relevant to my contractig model. It is presumptious to state that - my saying that my model is based on the redshift observations of galaxy clusters being 92% gravitational shifted, and 8% velocity related shifted, and the CMB radiation being 100% gravitationally shifted - is wrong b/c gravitational shift is grav.source minus grav.receiver. The redshift observations 'do' follow tautology as greater part velocity related via an expanding universe. The redshift observations 'do not' follow tautology as greater part velocity related for a universe contracting under the influence of gravity..
And with respect to cosmological observations, neither the velocity related nor the gravitational shift aspects of these redshifts are proven as experimental fact. Also, the experiment that I suggest has not been conducted a thousand times as you seem to believe. The experiment suggested is quite clear that NIST's portable clocks should be placed under equal circumstance of elevation and longitude, to equalise hieght from centre of earth and centripetal speed considerations, and that it is only a difference in the cicumstances of g that should be measured. A gravitational wave hit would also change the circumstances of g, and a clock placed at a gravitational wave site should be shifted by the wave. I do not wish to argue with you about these matters that I know to be factual. I do not proclaim my theory to be correct. I simply provide a prediction that can prove or falsify my idea. I'm off to concentrate on my paper now, but again state that I most certainly do not mean you any disrespect, but simply cannot spend any more time arguing my right to calculate differently where current theory premise is not experimentally proven. When I say the CMB is 100% gravitationally shifted, this is wrong in that there are no spectral lines in blackbody radiation. What I mean to say is that the measurement of the CMB blackbody radiation's cooling has been attributed to the spaces between mass' expanding. The spaces between mass' expanding has been attributed to an expanding universe, where the rate of the CMB recessional velocity has been found to be approx. 8% slower than galaxy cluster recessional velocity. So - my model, which contracts from it's post inflation initial conditions of an almost uniform sea of particles and energy, under the influence of gravity, states that the spaces we observe between the galaxy clusters are expanding b/c the galaxies of galaxy clusters are, over time, becoming closer to each other. The Hubble's ladder redshift observations of galaxy clusters are (in my model) approx.8% velocity related, and approx.92% gravitationally shifted by the changes in 'the field' caused by the gravitational clumping. And the CMB blackbody radiation is cooling due to the changes in the field. My stating the CMB as gravitationally shifted was technically incorrect. What I was trying to say is that the CMB (in my model) does not have a recessional velocity, and that the cooling is due to the changes in the field, where these changes are caused by the influence of the gravitational clumping of mass. The considerations of my YouTube video are concerning giving physical cause and effect mechanics for the phenomenon of gravity, and a spacetime structure that incorporates both GR and SR considerations in a singular description. I'll be posting a few more portions of this description later. This proposal for a modification of general relativity, providing cause and effect mechanics for the acceleration/attraction of gravity, results in fully described cause and effect mechanics for a very different cyclic bounce cosmology, where our current position, including the entire history of universal development into clumped mass occurs within the 'contraction' period. General Relativity can already describe a contracting universe, but to modify general relativity, (bearing in mind that physics has no comprehensive theory of time), I add another entirely seperate time function for background space - where the changes in the rate of this time can be considered as the phenomenon from which the effects of gravitational acceleration (not gravitational attraction) are emergent. This temporal interpretation of space time curvature constitutes a renormalisation term to the general relativity metric resulting in Euclidean geometry, or flat space. My model incorporates both general and special relativity considerations into a singular space time structure that addresses the quantum/relativity time problem resulting a 'pilot theory' type scenario of position and momentum. My model makes a definitive falsifiable prediction for doable experiments. a) An additional axiom "+energy=shorter seconds"
b) An additional axiom "The speed of light cannot exceed the local rate of time"
c) An additional time phenomenon for where m=0. I shall give full details on the cyclic bounce cosmology aspects of this model in chapter ?, where this axiom, "+energy=shorter seconds", is paramount for describing my model's contraction mechanics. But for now I will point out that this additional axiom results in a departure from general relativity, in that although all clocks tick faster in elevation to mass, as is experimentally proven, that a clock near a bigger mass will tick faster than a clock near a smaller mass. I point out that - although precision testing with clocks has been conducted with regards to elevation from gravitational mass, and with regards to relative motion - no precision testing has been conducted with regards to a change in the gravitational mass the clock is in proximity to. I will be giving full details of experiments with which only a change in g be measured via a clock in chapter ?. This prediction is directly related to this added axiom of "+energy=shorter seconds"
b) Introducing An additional Axiom: "The speed of light cannot exceed the local rate of time"
This additional axiom, "The speed of light cannot exceed the local rate of time", is paramount in describing (for my model) the passage of light across the cosmos, and is directly related to my model's addition of an additional dimension of time for where m=0. So before I introduce my model's additional time phenomenon and it's changes in rate, I will quickly go through some known time dilation considerations - that it be clearer the contruct of what follows. The diagam above is a quarter sphere (purple curve) plus equatorial bulge gradient (blocked green). Clocks placed at sea level at any placement on that equatorial bulge gradient (red curve/big dots) will all run at same rate. This is because, from pole to equator, the increase in centripetal speed caused by the increased hieght from centre of earth/planet due to the equatorial bulge gradient - where an increase in speed causes a decreased clock rate - exactly cancels out the increase in the clock rate that is expected of a clock when that clock is positioned at an increased height from centre of earth/planet. Therefore this model makes all it's considerations of the rate of time of 'clocks' on the basis that the observed clock rate is a combination of both general relativity(position in gravity potential) time dilation effects, 'and' special relativity (motion related) time dilation effects. That this additional time phenomenon for where m does equal zero occurs concurrently to the timing of clocks, but as a separate issue. The descriptions below will ask you to consider that there are not 2 but 3 time dilation phenomenons occurring. Time dilation 1 being caused by motion, both centripetal and other. Time dilation 2 being caused by postion of height in the gravity potential of M.
Note that this model states that time dilation 1 and time dilation 2 are for where m doesn't equal zero. This model introduces the additional time phenomenon and it's changes as time dilation 3 - this time being for where m does equal zero. ie: for particles m=0, and for the open spaces or 'background space' between masses. The considerations below are based on a simple idea that if an object is travelling in a background space that is inherent with it's own rate of time - a rate of time that the object must travel through - an object travelling at a constant speed over distances where seconds get progressively shorter, will be accelerated. And an object travelling at constant speed over distances where seconds get progressively longer, will be decelerated. The time changes in each of the 3 time dilations are then each considered as a partial dirivative of changes in acceleration, where when added together in the mannner suggested, these 3 partial dirivatives of changes in acceleration become the changes in acceleration that are proportional to changes in gravity potential. Page 1 introduces the diagram that I use to make my description. 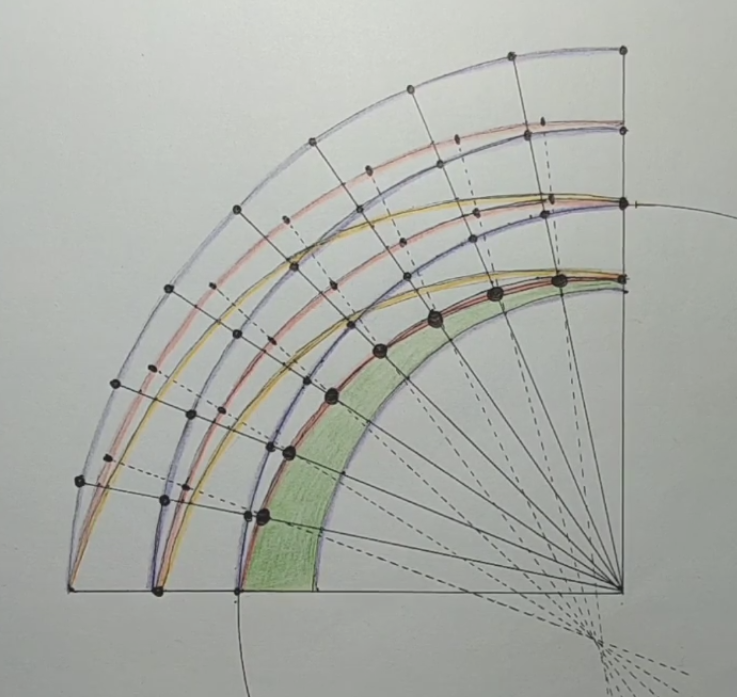 This structure of diagram, that conforms to Pythagaros as a geometrical consideration, is (as I am using it) a representation of the speed/distance/time formula. 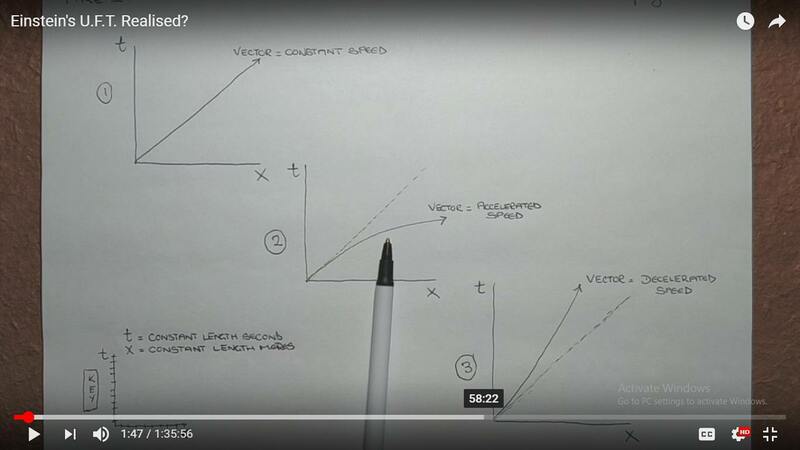 Time is on the y axis, distance is on the x axis, and the line (which I call a vector because all considerations are concerning the changes in acceleration of an object travelling on that vector) is the speed, where a straight line describes a constant speed, and a curved line can decribe an acceleration or a deceleration. That these plots, or graphs, can be representative of speeds that are constant, accelerated, or decelerated, relies upon the fact that the length of a second remains constant, and that the length of a metre remains constant. as demonstrated in the 'key' in the bottom left corner. Page 2 demonstrates that by saying that seconds get longer proportional to distance in diagram 4, or that seconds get shorter proportional to distance in diagram 5, (clearly by a specific rate), that an acceleration or deceleration in the speed of an objects vector can be represented as a straight line, where these changes in acceleration of the object's trajectory through space can be attributed to changes in a rate of time that occurs in this background space that the object is travelling through. 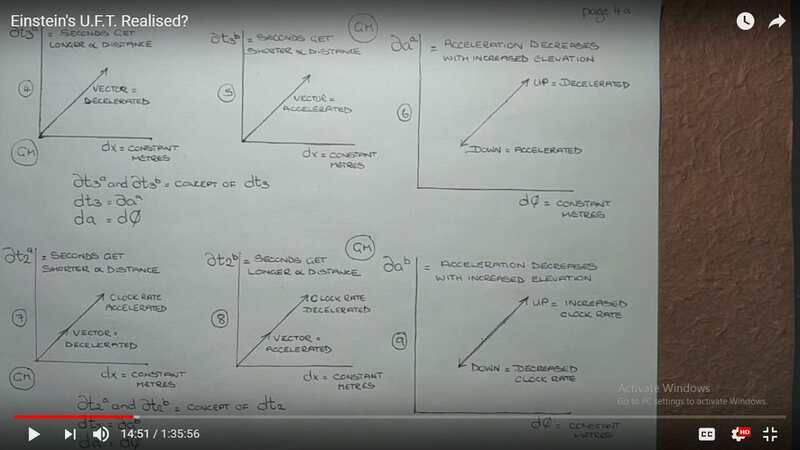 Page 3 demonstrates that seconds getting longer or shorter proportional to distance in diagrams 4 & 5, are 'up' 'down' functions, (partial dirivitives) of the same consideration, this being changes in time dilation 3 (dt3), and that these changes in time dilation 3 can be held relative to a partial dirivitive of changes in acceleration. Partial dirivitive because there are other changes in acceleration to be considered, where all the partial considerations added together in a suggested manner are then 'the' changes in acceleration, (da). Having introduced an additional time phenomenon and it's changes as (dt3) in pages 2 and 3, I now state that changes in time due to motion will be refered to as (dt1), and that changes in time due to position in the gravity potential will be referred to as (dt2). 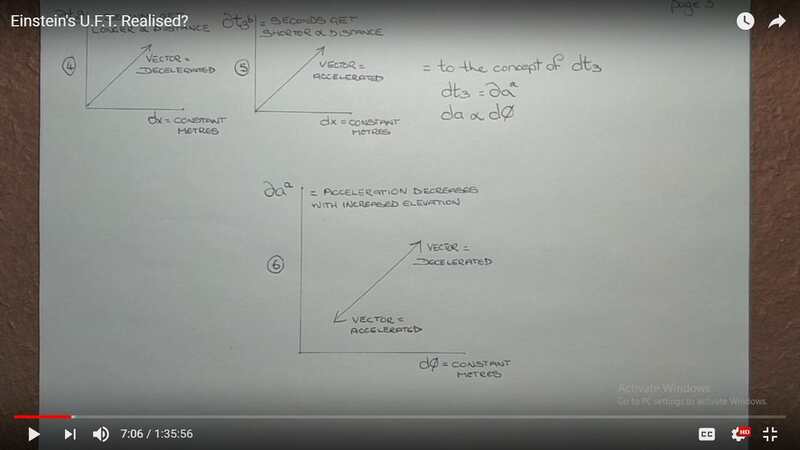 Page 4a repeats the introduction of (dt3) from page 3, and then introduces (dt2) as an inversed consideration, (please note these curve manipulations do not represent true values as of yet), but in this case the changes in rate of time are occuring for the clock that is on that vector travelling the distance on x. 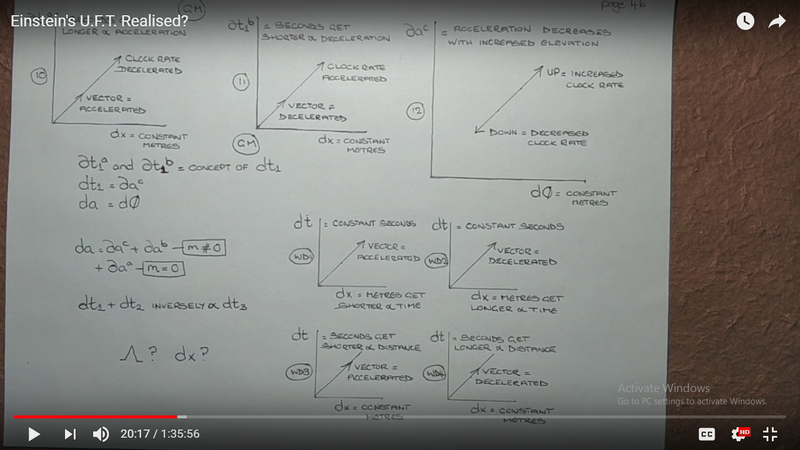 This diagram is saying that an accelerated clock rate will cause an object's (the clock's in this case) vector in the 'up' direction to be decelerated , and that a decelerated clock rate will cause an object's vector in the 'down' direction to be decelerated. Page 4b introduces the changes in time due to centripetal motion* in the gravity potential as (dt1), where the changes in time dilation 1, (dt1), with regards to centripetal motion*, are occurring inversely to the changes in time dilation 2,(dt2). Now there are 3 partial dirivitives of acceleration. Partial dirivitives of acceleration (b), (being equal to (dt2)), and (c), (being equal to (dt1)), are for where m doesn't equal zero. Partial dirivitive of acceleration (a), (being equal to (dt3)), is for where m does equal zero. Added together, these partial dirivitives of acceleration become 'changes' in acceleration (da), where (da) are held proportional to changes in gravity potential. And the changes in time dilation 1 (dt1), plus the changes in time dilation 2 (dt2), at any observed position in the gravity potential, are equal but inverse to the changes in time dilation 3 (dt3), where the changes in time of a clock in the gravity potential are those observed by the observer who we presume to be making the calculations. 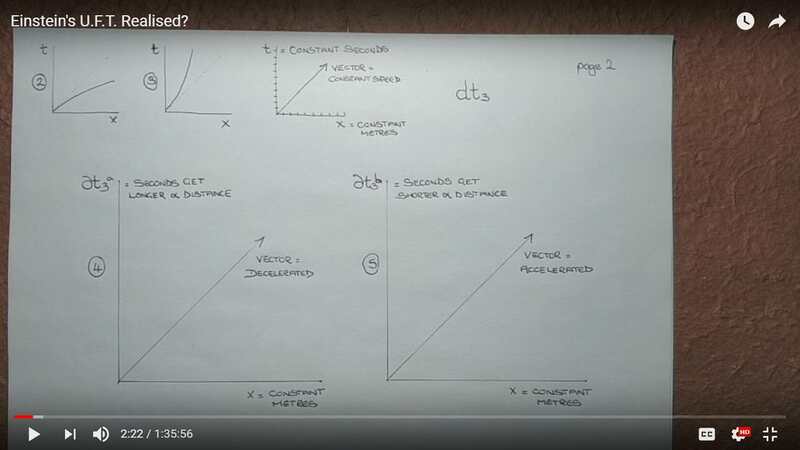 What these working diagrams demonstrate is that changing the length of a second can provide the same results as changing the length of a metre. Page 5 demonstrates how the additional time phenomenon I have added can be slotted into a singular description of General and Special Relativity as a spacetime structure, and does so without changing the ideas of the underlying Relativity mathematics*. @Colin2B, I will be back with a revised page 5 at some point soon. Am I getting it across so far though? I’ll have a read through these and get back to you, might be a couple of days so keep posting if you want to. I’m not commenting on whether your ideas clash with std physics, nor on points I’ve made before. I would suggest you shorten your abstract to maximum of 2 paragraphs of no more than 10 lines each. Most of what you then call abstract could be in an Introduction. This sounds similar to “speed of light being same for every observer”. You don’t really give a fag packet description of what you mean by it, so reviewer will not really understand what you are saying. Chapter 1 seems to be an accurate description of what you are saying in your video. I would word it all differently, but that is down to personal style and it’s important you keep your own. She is the one who suggested using atomic clocks to detect subsurface anomalies and will be an endorser, but more importantly your experiment will be lodged in her mind when they do the measurements. Wow - Thanks Colin! Above and beyond! Yes, I will follow your makes sense advice on the abstract and intro. I still have to draw out page 5 again, there is a mistake on the video page 5, and I can make a better description. But it is only when I include pages 8, 9, 10, and 11 that pages 1 through 5 make sense. I'm having a break from it being as I am at grandma Joan's. Back on it when grandma duty is done. Can I make a suggestion which is made to all authors? When you have finished your book/article etc, just let it go, move on. Don’t expect any endorsement or acceptance, your ideas will have been registered and if correct then the test, when done, will confirm your prediction. I know you won’t let it rest in your mind until you have given it the best chance, but I hope that once written up you will have some satisfaction of a job completed and be able to let it go. No matter what the outcome, remember, in the journey you have learnt a lot. Once your paper is published to a scientific journal, then any person who subsequently uses any part of that concept within their paper is then required to cite your work. Easy to let go under those circumstance. Just bear in mind that you are unlikely to be published in a scientific journal. You may have to be content with publishing here and also making a few key people aware. At some stsge you have to let it go its own way and live the rest of your life. In a physics climate that spends billions of dollars in research projects to investigate theories such as string theory, loop quantum gravity, holographic universe, asymptotic gravity, etc, that cannot make any falsifiable predictions to prove or disprove the theory, one would have thought that a person who can provide a falsifiable prediction for a 'really cheap' experiment* that will prove or disprove their theory, might well get published. Only time will tell, aye? Anyway it is good to hear - should an experiment with clocks determine that a clock will not only tick faster in the higher potential near a GM, but will also tick faster when it is placed near a greater GM than it will if placed near a smaller GM - that you and the other moderators here will recognise that this is what I have been saying on the forum for years. Not sure about the LIGO idea, but currently the lead team are modelling Mt Etna. They want to be able to measure subsurface movements of mass eg magma chambers and so be able to predict eruptions. That will attract money, so I’m sure the tests will be done as soon as practicable. days could be associated with magma movements underground"
Under this remit, if my theory is correct, then when the gravimeter says that a chamber is filling up with magma, the clock will tick faster, saying to the experimenters under GR remit, that the ground is rising when it isn't, or isn't rising as much as the data suggests. And when the gravimeter says that a chamber is emptying, the clock will tick slower, saying to the experimenters under the GR remit, that the ground is subsiding when it isn't, or isn't subsiding as much as the data suggests. “Essentially it relies on the fact that any mass will generate a gravitational field, which can be detected with a very precise gravity sensor,” says Kai Bongs at the University of Birmingham, who helped develop the device..."
"...That’s why the oil and gas industry could be particularly interested in the gravimeter. It could be a powerful tool to help map out valuable deposits of oil or minerals, because denser materials will have a stronger gravitational pull than open pockets beneath the earth"
So the atom cloud in the chamber will arrive at the bottom of the chamber quicker if the density of the ground is higher. The clock's electron transitions are predicted by GR to occur at a lower frequency or slower tick rate if the gravitational pull is higher. My theory predicts that the clock's electron transitions will occur at a higher frequency or faster tick rate if the gravitational pull is higher. It would the finest thing in the world to live to see a finalisation of my train of thought manifest in the result of this type of experiment that is testing only against changes in g, no matter which way the experiment is observed to shift. My theory has been a journey of thought process for me, and as a private venture that has been the most enjoyable experience in the whole world, but contrarily, as an idea that I have been trying to share it has been the most painful thing in the whole world, and I'd just as soon know the result of the experiment and then be done with thinking about it. This is the bit I will be interested to see when you post it. I promise not to comment on whether I agree with it or not. My golden rule in physics is never to be in agreement with anything that isn't experimentally verified. If it isn't experimentally verified then it is only a theory. In my opinion it would be unreasonable of me ever to expect anyone to agree with something that is only a theory. All I would expect from anyone with regards to my theory is an interest in whether or not the theory can be mathematically viable, and - given that I can show that it be mathematically viable - that the theory be tested experimentally. I have actually already shown you why my theory makes a contrary prediction to GR with regards to 'only' changes in g for a clock, when I gave you the 'table of contraction' concerning how time is uniform at end of inflation, and divides into faster pockets of time where mass has clumped, and slower tracts of time in the spaces that are caused by mass vacating former positions during the clumping process. These time changes then actually being the physical cause and effect mechanics for the observed phenomenon of gravity. Anyway, hopefully I'll get that across in the paper. Page created in 0.245 seconds with 76 queries.